Family reunion t-shirts have become quite popular for family reunions of all sizes. We get a lot of customers that are in charge of making t-shirts for their family reunions. They come to us to order blank t-shirts and then find a local business that will do the printing. Some of our customers are ordering t-shirts for huge family reunions with up to several hundred people. 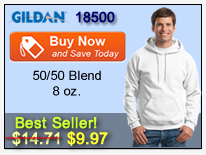 They find that it is easier to order a variety of sizes without getting specific size requests from the attendees. This may be because it is just too time consuming and difficult to contact every single person. In other cases we'll have customers that know exactly what size t-shirt is needed for everyone that will be at the family reunion. 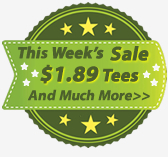 The nice thing about buying family reunion t-shirts from us is that you can order any quantity that you need of any size and still get the quantity discounts within the same style number. We also have a few toddler t-shirt options such as the Gildan 5100P and the Rabbit Skins 3301T. 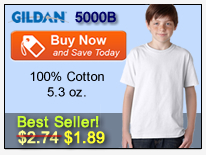 One advantage of going with Gildan is that the 5.3 oz t-shirt comes in an adult size, a ladies size, and a youth size. 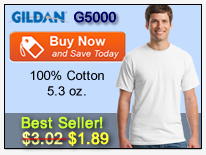 We have listed these Gildan T-Shirts below for your convenience. 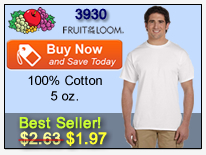 We also have a brand new Easy Collection by LAT that offers 9 shirts in different sizes, all 100% cotton and 4.5 oz. There are a few colors within this collection that are not 100% cotton which is stated on the individual product pages. We are happy to be able to help you take care of your family reunion t-shirts and are available for any questions you might have. Visit our contact page for more information on how to contact us by phone or email.